J M Spinks was an early Vancouver pioneer. We’re pretty certain he had the dubious distinction of getting embroiled in legal argument to land claims even before the city was established. It doesn’t seem to have been an impediment to his later success, although he seems to have rewritten history a little by claiming in the 1901 census to have arrived in Canada in 1887. John Manly Barrington Spinks was born in his preferred version in 1853 in Liverpool (that’s his birth year on the 1891 and 1901 census forms). One version of his story is that he arrived in Victoria in 1884 and lived briefly in Duncan before moving to Granville in March 1886. Unless there were two J M Spinks in the city at the same time, he was probably here a little earlier. While there are two different birth dates for a John Manly Barrington Spinks in Liverpool (suggesting an earlier child died, and a second was given the same name) his birth date record in the UK was 1850 (Although in the 1881 English Census – where he was a butcher – this had already slipped to 1851). A Select Committee of the Provincial Legislature heard evidence in 1884 “About fifteen years ago two Indians, named Charlie and Jim, squatted on said land and made improvements thereon (including building two houses), several clearings, &c., and resided continuously upon the land until the sale presently mentioned, and one of them is still upon the place, it having been arranged that he shall receive the year’s crop of potatoes. On the 23rd June, 1884, the said two Indians conveyed their right and title to said land (with the consent of the Indian Agent) to one J. M. Spinks“. In further evidence it became apparent that Mr Spinks had a partner, Sam Greer (later of Greer’s Beach – now Kits Beach) who had paid the Indian Agent for transfer of title to the land, but put the land in Spinks’ name as he thought it more likely that Spinks claim to title would be accepted. “In reply, I am to inform you that your application cannot be entertained, as the Chief Commissioner cannot admit that the Indians ever acquired a claim to the land in the slightest degree. “The land in question, among others, was leased to the British Columbia and Vancouver Island Spar, Lumber, and Saw-Mill Company (Limited), by Indenture dated 13th November, 1865, for a term of twentyone years. “According to the terms of the agreement no portion of the lands so leased could be pre-empted or entered upon by bona fide settlers or pre-emptors without the written sanction of the Governor and Superintendent of the Saw-Mill Company. In further evidence it was clear that all the purchasers were unhappy with Mr Spinks. As well as he having successfully sold on a claim that he probably didn’t have legal rights to sell, it was also suggested that the claim as staked was 160 acres, but as sold was 400. Sam Greer was probably the least happy – he was out of pocket and he was then accused of (and taken to court for) forging the document claiming title in the first place. This is the simple version of the story – there are even more twists in other people’s memories of the ‘deal’. This didn’t seem to cramp Mr Spinks style at all. Initially he was partner with Walter Graveley – who in 1932 remembered rescuing the metal ‘Graveley and Spinks’ sign and putting it behind a stump as he ran from the 1886 fire, only to find it melted from the fierce heat. For no obvious reason, Mr Graveley recalls Mr Spinks to be called ‘Bob’. Later Spinks partnered with R G Tatlow in real estate promotion, although the year that this building was built, 1891, that partnership was dissolved and he continued in the real estate business alone. He and Tatlow developed at least one property near Seymour Street. He had a house built on Seaton Street in 1888, designed by Henry Bell-Irving. Later he partnered with R C McKay and Dr Israel Powell on a commercial block on Pender at Richards, designed by Fripp and Wills. John’s brother, William also moved to British Columbia. A barrister by profession, he was practicing in Kamloops by 1884 and was sworn in as a judge in 1889. He had Fripp and Wills design a house in Swan Lake in 1892, and was obviously an aficionado of the Arts and Crafts style as he hired Greene and Greene to design his retirement home in Pasadena in 1909. According to the 1891 census 38 year old John M Spinks was married to Jane (originally from Paddington, and possibly a year older than he was, depending on when he was really born), and had a son, John M, another, Richard and a daughter, Mary, as well as their domestic, May Austin. Jane died, along with her new born baby, in 1892 and by 1901 John was married again to a Danish born wife, Ursula, 17 years younger than him (and only seven years older than his son, Richard). In 1903 he apparently moved east, to Toronto and in 1911 had a wife 19 years younger, Ella, recorded as having been born in Ontario. For the building, Walter Graveley, who owned the lot, partnered with Spinks to develop a triangular building on the awkward lot created where the rail right of way cut through the street grid at forty-five degrees (behind the building in this 1939 image). 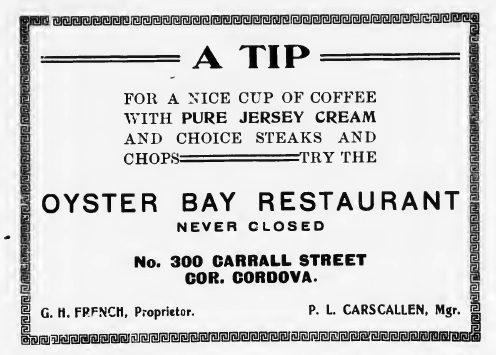 Designed by the Fripp Brothers, the building became well-known as the home of the Oyster Bay Cafe. In 1913 Fripp was again hired by Gravely to work on the building. At the time it wasn’t called Cordova, but rather Oppenheimer Street. 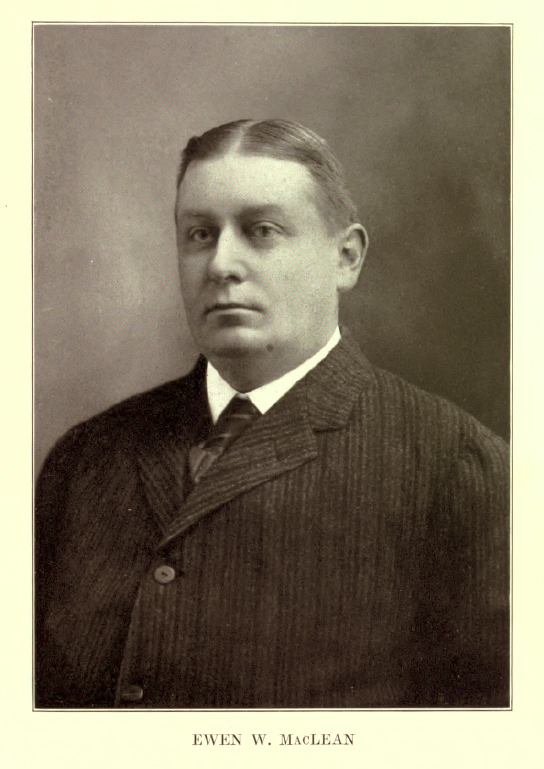 Gravely was born in Cobourg, Ontario, in 1853. In 1873 he worked in Toronto in the marine insurance business for eight years, then two years in Winnipeg as a real-estate and financial broker, and finally Victoria where he opened an office with F C Innes while they waited to see where the Canadian Pacific terminus would end up locating. In 1885 they separately moved to Vancouver, as did C D Rand, and set up rival real estate sales offices. Graveley had the receipt for the first piece of land sold by the Canadian Pacific in 1886 (which miraculously survived the 1886 fire), and continued to acquire and sell land. As far as we can tell this was his only foray into property development. He married in 1888 and his first daughter was born in San Fransisco (his wife’s home town) in 1890, followed by a second in Vancouver in 1900. As well as his real estate activities, Graveley was known around town as the first Commodore of the Royal Vancouver Yacht Club (he was responsible for getting the ‘Royal’ label. He also dabbled in a railway company that was to build a spur to Chilliwack, although nothing came of that scheme. By 1913 he had retired, although he lived on until 1939. Today the site has another curious triangular building, the retail component of a condo project called The Van Horne completed in 1996 and designed by Kasian Kennedy as a partner to Carrall Station on the opposite side of the street, finished a year later. 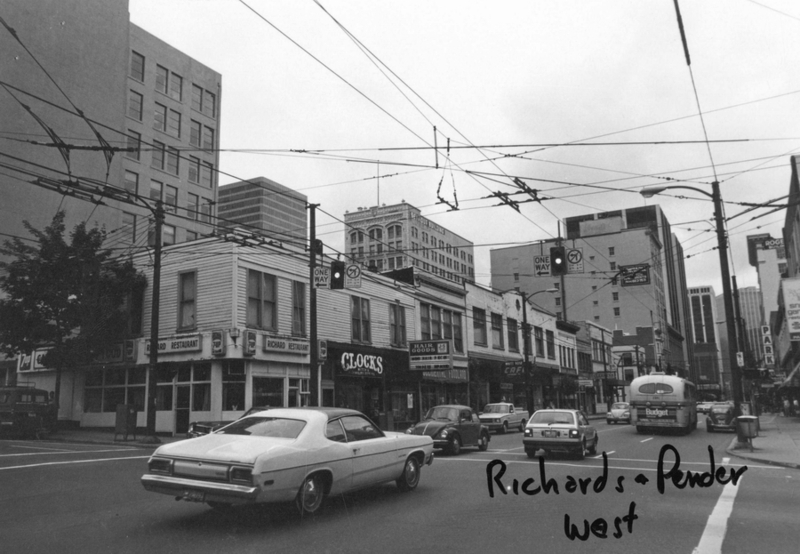 Here’s a 1956 picture of a two-storey building on the corner of Burrard and West Pender. If it’s looking a bit shabby, that’s because it’s heading for demolition. It was built in 1910 by owner, and supposed architect E W McLean, and built by R P Forshaw at a cost of $50,000 as stores and apartments. This was not the only project developed by the same owner / builder combination – there was also a $5,000 house on the corner of Nelson and Bute. While Mr McLean’s skills were surprisingly varied, architecture wasn’t something mentioned by his biographers, despite his claim to be the architect on the Building Permit. This is confirmed by an entry from a 1910 copy of the Contract Record that notes the construction of a “commercial block for Arthur E. McEvoy and E.W. MacLean” designed by J S Helyer, the architect of the Dominion Building and Stock Exchange Building. There’s a bit of confusion about how Mr Mclean spelled his name. The Building Permit, and the 1901 census both have McLean, but his Biographer spells it MacLean – so that’s what we’ll stick with. Ewen Wainwright MacLean was described in 1914 as “one of the most prominent capitalists in Vancouver and on the Pacific coast of Canada, has been engaged in the real-estate, loan, investment and insurance business for about two decades and is an active factor in the control and management of various enterprises.” E W’s father was Scottish, his mother from Canada (born in PEI into a Scottish family) but E W was born in Nagasaki, Japan, where his father acted as superintendent of the lighthouse service. He was sent to school in Hong Kong, so was fluent in Chinese, explaining why his 1901 Census entry gives his employment as a Chinese Interpreter. Mr MacLean had significant property development interests in addition to the modest building at Burrard. He was vice president of the Exchange Building, Limited (hence the connection to J S Helyer as architect). In association with J. W. Weart he organized the Investors Guarantee Corporation, Limited, where he was vice-president, and built the fifteen-story Weart building at the corner of Hastings and Richard streets. (although a deal with tenants ensured it became The Standard Building). He also had a railway interest as vice-president of the Southeast Kootenay Railway. Arthur McEvoy had arrived in Canada in 1889 from England, and the 1901 Census says that at the age of 26 he was already a barrister (having been called to the bar in 1899). There’s a Sam Kee connection to Mr McEvoy as well. In 1908 the company the company purchased standing timber in the Hastings Townsite and then approached Arthur McEvoy to offer the cut wood to City Hall, the City Hospital, schools, churches and “any other big buildings” to clear the stock before the summer. A Director of a number of companies including the Howe Sound Development Co and vice-president of the Howe Sound Northern Railway, in 1913 Mr McEvoy acquired the Coalmont Colliery and as president of the company saw 4,850 tons of coal hauled from the mine in 1914 before the war put a temporary halt to operations. Both developers of the building were members of the Liberal Party and members of the Terminal City Club. While Mr McEvoy and his family lived across False Creek at 1290 West 12th Avenue in 1910, but a year later was at 1147 Nelson Street, while Ewen MacLean lived at 1184 Nelson Street. 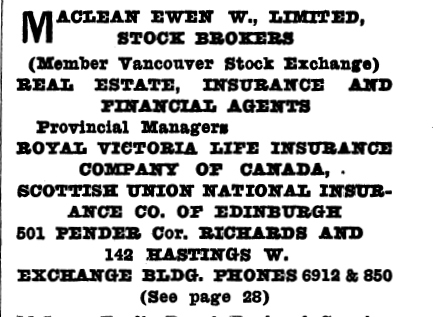 (Actually there were two Ewen MacLeans at that address as Ewen MacLean junior was an assistant cashier in his father’s company, but was still living at home in 1911). The building that replaced the MacLean and McEvoy investment was Bentall’s first office tower downtown (although not the first office building). Charles Bentall was present in 1965 (aged 83) when the ground-breaking for the 21-storey tower took place, and exactly a year later he was present with the mayor when the final concrete was poured to ‘top out’ the building. The Bentall family construction company, Dominion, moved into the building on its completion in 1967, the year that Tower Two started construction. Both were designed by Frank Musson who worked until 1965 with Dominion Construction, and then founded Frank W Musson and Associates, later the Musson Cattell Mackey Partnership, responsible for designing the other two towers of the complex. We don’t know who designed the Golden Gate Hotel (on the corner of Davie Street) but the possible architects are on a relatively short list, as it dates back to 1889, making it around the same age as the Yale Hotel a block away. In fact it’s slightly older than the Yale (which was then called the Colonial Hotel), as it was connected to the water system in March, while the Colonial wasn’t hooked up until July. The Colonial Hotel and the Golden Gate first appear in the 1889 Directory and the Colonial was designed by N S Hoffar (as was 1286 Granville nearby) so he may have designed this building as well. O S Bergland is listed as proprietor of the Golden Gate in 1889, (offering First Class Board, Pool and Billiards) although in 1890 and 1895 F G Twigg is the listed proprietor (and the building is also called the Holman Block for some of this period). In 1894 Captain Tatlow had addressed a friendly crowd in the hotel in support of the government. In 1896 it’s listed as being vacant, and there’s no sign of it in the 1897 Directory either. 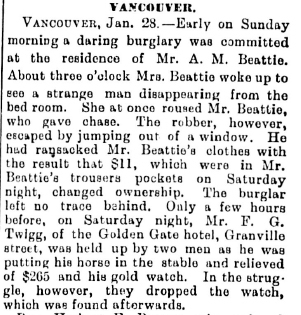 This may have been connected with a pair of unfortunate incidents recorded in the Times Colonist. On the left you can read how Mr Twigg lost $265 and a gold watch when he was held up as he was stabling his horse. To add insult to injury, two days later his horse and buggy were stolen. Note the somewhat random use of initials in the 19th century press. In 1898 and 1899 the Golden Gate Hotel is back in business, McHugh and Kelly, proprietors. From 1899 to 1904 Samuel J Teese, an Irishman who had arrived in Canada in 1881 is back running the hotel. In 1901 the Census shows us there were a number of boarders – four Americans including two carpenters and a car repairer, another car repairer from Cape Breton, a carpenter from Ontario, a barber from Ontario and a fireman, also from Ontario and a labourer from Nova Scotia. (we assume the car repairers worked at the CPR yards nearby – many earlier tenants of the hotel were CPR employees too). William Hinson was the cook and Anne Vincent the waitress. By 1905 the hotel proprietor changed again to George Mottishaw, and in 1906 Quintin Trotter bought the hotel. A native of Bobcaygeon in Ontario, Mr Trotter took 3 months to remodel it (he was a skilled carpenter having worked at the sash and door works and on fitting out the Princess Victoria). Mr Trotter renamed it the Tourist Hotel and sold it to George Trorey in 1908, who retained ownership to at least 1941. In 1908 the Tourist cafe was listed – but the hotel was not mentioned. In 1909 the Tourist Hotel has Montagu Gladwin as the barman along with James McIsaac, Phillip Hacquoil was listed as proprietor and only 2 boarders were mentioned. In 1911 and 1912 J Montgomery Reeves is listed as proprietor, but we know the hotel was owned by G E Trorey, who used W H Pawson to design alterations in 1911 carried out by Western Sheet Metal Works. George Trorey was a wealthy jeweller who had his own company which he had sold to Henry Birks, becoming Birks’ General Manager. Presumably the hotel was an investment and the various ‘proprietors’ listed in the directories carried out the day-to-day management of the hotel and bar. Staff changed frequently and comprehensively: in 1911 Clyde Gladwin was the bartender (Montague Gladwin was now at the Yale, a block south) . In 1912 Mr Reeves was still shown as the proprietor, Fred Dunn was the bartender with James McIsaac, Joseph King and Hector Ross clerks, Minnie Donovan and Margaret Elder were waitresses, William Wilson the steward, John Conroy and Jeremiah Maroney, both stonecutters were resident along with John Glasgow a checker with a dairy and William Haley (who worked for the Western Sheet Metal Co) and a fitter and carpenter. A year later the proprietors were Tony Cianci and Joseph Feren and barmen Ernest Appleton and Thomas Barry had joined James McIsaac. Herbert Carr was clerk, Nellie Reid and Anna Wachholtz were waitresses, J H Simpson who operated the Canadian Film Exchange was the only listed resident. In 1915 there were only two residents, James Wilson and John McNeil, both loggers and Rebecca McNeil was the maid. James McIsaac was still at the bar, joined by John Smith. By 1920 the building was no longer a hotel; there were 6 apartments as well as Dr Geer and Dr Gibson in the Tourist Block, with the Bank of Nova Scotia occupying the ground floor. That arrangement was still in place in 1925, although the doctors were no longer there. By 1931, when our VPL image was taken, the main floor was listed as vacant, the bank having moved, but all eight apartments were occupied. Today it has almost the same arrangement – there are eight rental units (self-contained, renovated in 1974) and retail below – these days the Two Parrots Taverna. We have already see the Louvre Hotel very soon after its construction in 1889. A section of the Louvre was lost in 1940 when the adjacent Bijou Theatre was demolished. Here’s the Bijou and the Louvre in 1909. 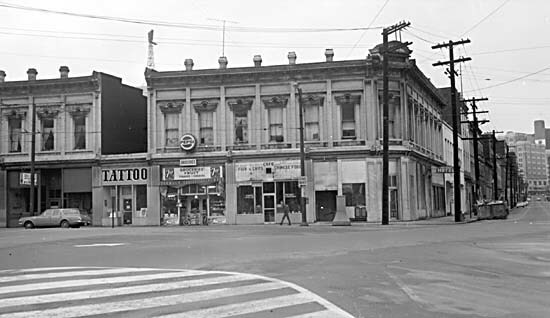 As well as the Louvre Hotel and Cafe there was a combination business at 329 1/2 Carrall Street – Anderson and Nelson, tobacconist & barber. The Bijou in this picture was actually a conversion of an earlier building whose architect is unknown. It seems to date from 1896 when it appears to be home to Langley and Co who were wholesale druggists. In 1899 it was the English Chop House and in 1901 it appears to have been vacant with the upper floor occupied by Nora, the widow of G A Biers. It was the Strangers’ Rest Coffee House in 1904. In 1906 and 1907 it was listed as furnished rooms and the first mention of the theatre is in 1908. 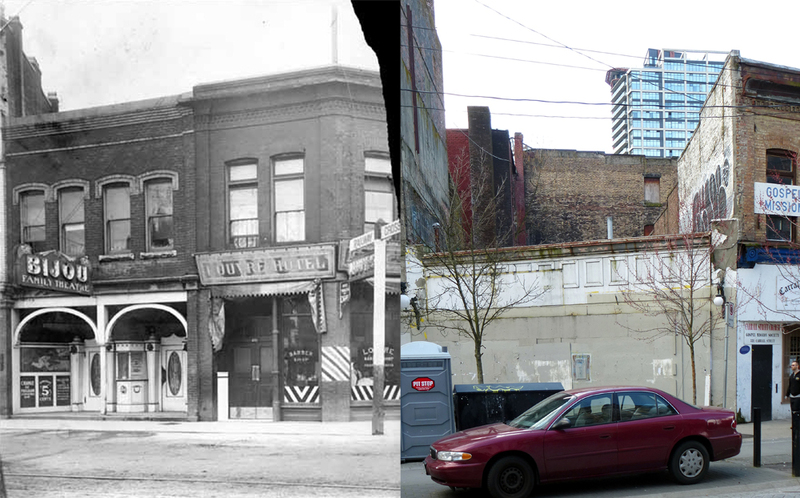 In 1909 (when the picture was taken) the proprietors of the theatre were Hoar Hermann & Sharratt – Charles Hermann and Harold T Sharratt ran the theatre, and Hoar was probably Harvey E Hoar who also managed the Rose Theatre which showed moving pictures at 126 East Hastings. Mrs Charles C Pyle was cashier of the theatre. At the Louvre, John Gaedres was proprietor, Carl Asback, Norman Cameron and Edward Harff were bartenders, Norman Gaedres ran the cafe (and lived upstairs) and Robert Inman was the cook. A published source says Al Principe ran his barber’s shop from the Bijou, but it looks as if it was part of the Louvre in 1909. In 1913 a new theatre was built, designed by Donnellan and Stroud (although only James Donnellan’s name appears on the Building Permit. That’s almost certainly the building seen in the this 1940 image, just before it was demolished. In 1913 William P Nicholls was the proprietor, Walter Buchanan the doorman, Mrs Sam Driscoll the cashier, Arthur Gildner and Lewis M Potter wer the operators (presumably the projectionist), Ethel Copeland and Olive Beaton the musicians and Percy Anderson the usher. Two years later the operation was much smaller; P Willis was the proprietor and William Scott the operator. It doesn’t look much here, but for a while it was quite something, as this night shot taken around 1913 shows, with the brilliant illumination of the facade advertising the 5c admission. It looks as if part of the Louvre was incorporated into the new theatre (which is why there’s less of the Louvre today than when it was built). It also looks like the barber’s shop was now in the theatre, rather than in the hotel. 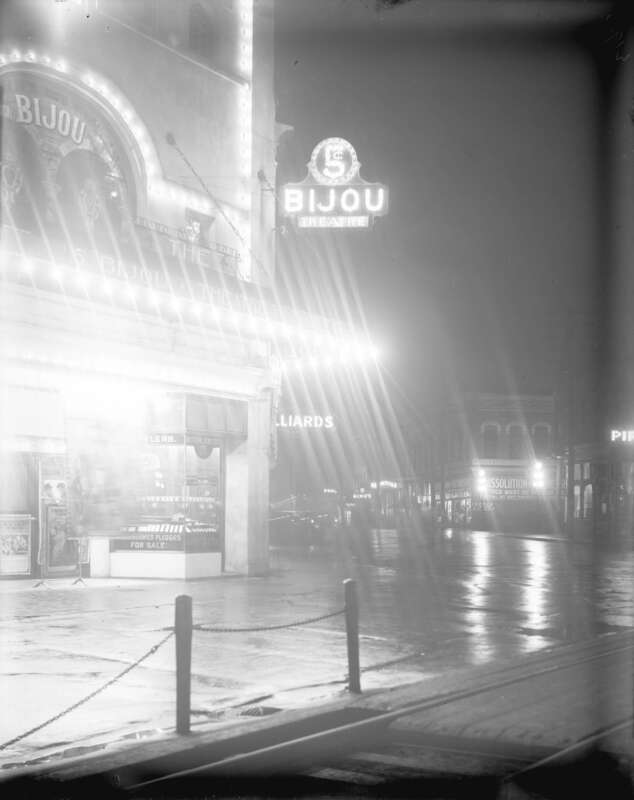 In 1918 Walter Anderson is the proprietor of the Bijou, but by 1919 the cinema use had gone. Morris Zlotnic seems to have his jewellers shop at 333 Carrall, but somewhere around this period the street numbers appear to have been reassigned. 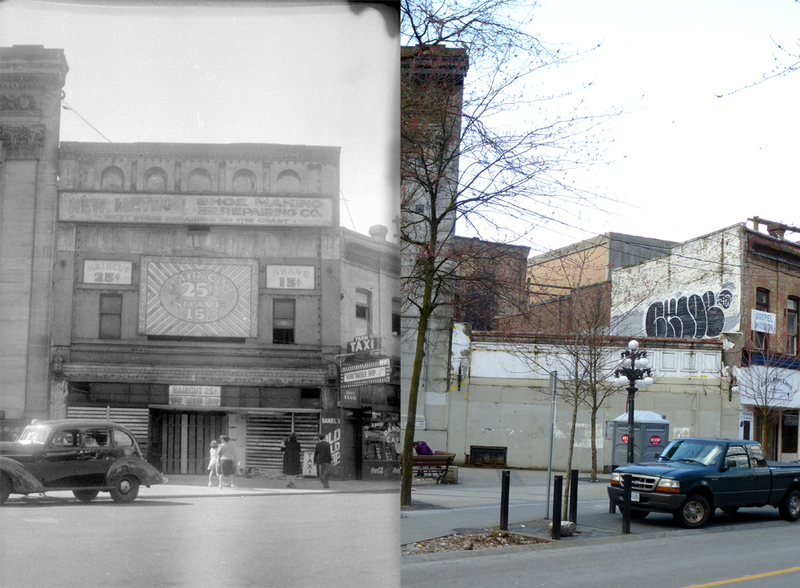 Up to now the Bijou was always 333 Carrall. In 1919 William Anderson us running a shooting gallery at 317 Carrall, which seems a very likely use for a former cinema, but less likely for any other space. There’s still a shooting gallery in 1922. Painter and paper hanger J C Rowley wasn’t in this building for all that long. We assume he is in the picture, presumably with his employees. We don’t know if bowler hats were required for painters, or just a fashion statement in 1894. We’re not sure when Mr Rowley took occupation of these premises as there’s currently no directory for 1893 available. He wasn’t around in 1892 when 508 Pender was occupied by T Prest & Co, real estate agents. In 1890 Mr Prest was still there, but the block was numbered as 408, and there was no 408 Pender in 1889 so that’s probably when it was built. 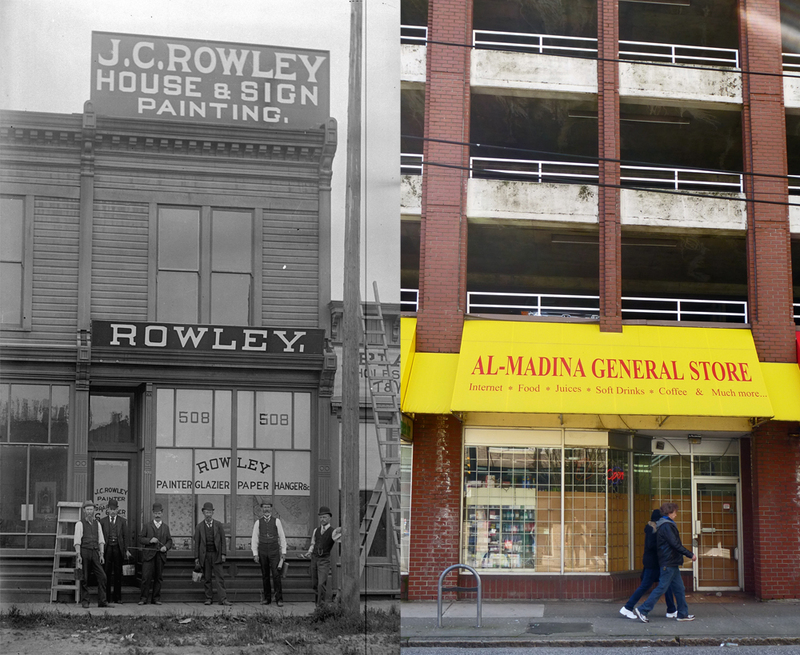 By 1896 J C Rowley had moved to 1 Pacific Street and 508 Pender was occupied by Andrew Armstrong who was a cleaner and dyer with a home in Mount Pleasant. That’s the last reference to J C Rowley in Vancouver – it seems quite possible that he moved on to New Zealand – there’s a painter called J C Rowley who won a contract in Auckland in 1898. It looks as if the building stayed undeveloped for nearly 100 years. Here’s a late 1980s image that suggests it was still standing with surprisingly little change. In 1912 J P Matheson had designed an office for the North West Trust Co that took a slice off all three Pender Street lots, but that was a little way up Richards Street. Today it’s called the Lumberman’s Building, and it’s still standing. In 1990 Kingsley Lo’s design for a 246 space parkade and retail building was completed – one of the last new parkades built downtown. It’s unusual in that it’s ‘L’ shaped, wrapping round the Richards Street office building. It took two years to build, and when it was first completed in 1925 the Devonshire was the big kid on the block. 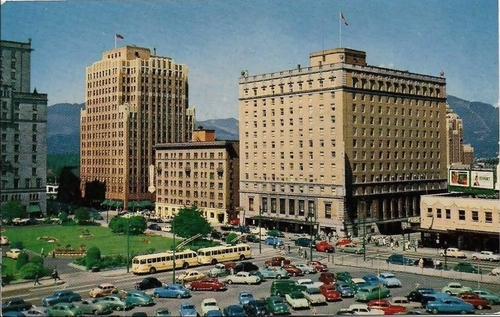 It soon became far less significant as the Hotel Georgia was built to the east two years later and the Georgia Medical Dental Building (by the same architects as the Devonshire) to the west two years after that; both several storeys taller. It wasn’t really a hotel at that point, but rather an apartment hotel. It was designed by McCarter Nairne early in their career and set them on the road to success and even bigger buildings (especially the Marine Building). The Devonshire advertised for tenants – here’s a billboard at Clark and Kingsway from 1931. In 1930 there were engineers, a stenographer, clerks and a seamstress – but the directory also shows there were nearly as many maids and other staff (including two telephone operators) working there as there were tenants, suggesting it was already more of a hotel than an apartment building. The hotel advertisement said it was “Canada’s Finest Apartment Hotel” with “Modern and luxuriously comfortable Kitchenette suites and Hotel rooms, all with bath . . . just a few minutes walk from the stations, waterfront, and the glorious Stanley Park.” The hotel offered free telephone service, and charged $3.50 for a single and $5 and up for a double. In the early 1930s the manager was T Karl De Morest, who also ran the Devonshire Cafe, while the Devonshire Cab Service was run by Messrs Brown and Walker. DeMorest could well be Thomas DeMorest, born in the USA and living as a child in the Okanagan in 1911. In 1937, quite early in his career, CBK Van Norman designed alterations and additions to the building, almost certainly when it became simply a hotel. Not long after the dust settled, many publications will tell you that work began on building the HSBC Bank Canada building. That isn’t completely accurate, what was really being built was the Bank of BC Tower designed by Webb Zerafa Menkès Housden Partnership. The second bank to bear the title (the first having disappeared in 1901) it was founded in 1966, the creation of Premier W A C Bennett. By 1986, following financial difficulties arising from poor management, HSBC was allowed to rescue the company. It’s a post-modern stumpy block covered in granite supplied from Quebec. A huge internal public atrium is lined with granite from South Dakota – over two billion years old – featuring Alan Storey’s ‘Broken Column’ pendulum artwork.